Kabsa originated from Yemen and now can be all across the Middle East. A traditional dish, Kabsa is part of all celebrations and best enjoyed with family and friends. 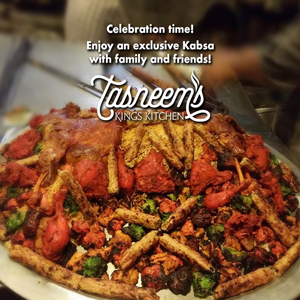 At TKK, Kabsa is served on single big thaal. At the base is a bed of creamy chicken pulao with a tender, succulent, slow-cooked Raan in the center generously topped with tender kebabs and tikkas of six different kinds and served with sinfully rich red curry. We serve Kabsa for groups starting from minimum 6 people. Rs. 1000++ per person. To book your Kabsa call 9801121212. A day’s notice is required.